I found your blog through a group I'm in (FirstTimeSocknittersKAL@yahoogroups.com) and wanted to comment on your "prince" . What a regal Siamese! Of course they all are, aren't they? I'm currently knitting a pair of socks on a loom (http://decoraccentsinc.com/sock_knitters.html) but I have a couple sets of dpns from my grandmother's stash that I would like to learn to use. I've become addicted with Cherry Tree Hill Super sock from http://stores.ebay.com/emtnestr on eBay, so now I need to knit, knit, knit! You're also not far from me - I'm in Front Royal. Nice to "meet" you! 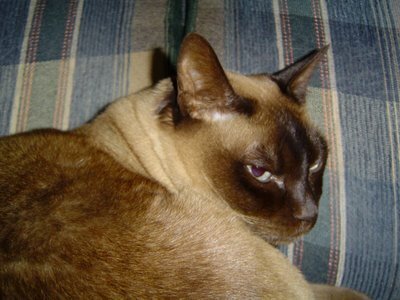 I have a Siamese cat, too. I think they are the best! Hope he will adjust okay to the new puppy. Oh I'd be excited too! A new puppy! I can't wait to see pictures. Have you been thinking of names? I really love your kitty, such a sweetie! Hope she'll be getting along fine with the new member of your family - looking forward to seeing pics of the new puppy!